If you’re only concerned with staining, a simple whitening treatment is all you need to have your smile looking its brightest. That said, some people suffer from issues that go beyond discoloration, such as crookedness, chips, or large gaps. Whitening treatments won’t do anything to solve these issues, but you can opt for either bonding or veneers. It can be tricky to choose between them since there are strong arguments on each side. To find the best approach to meet your needs, read through the pros and cons of each treatment. Bonding uses the same composite material that most modern fillings are made from. That material is matched to the colour of your teeth before being shaped to cover up imperfections. This means any imperfections will be masked rather than covered, and bonding can protect the roots of your teeth if the gums have started to recede. Probably the main benefit associated with bonding is speed. Minimal preparation is required for bonding – you can usually complete the whole procedure in one simple appointment. Bonding is also a good choice if you’re only concerned with one or two teeth, and it’s a more cost-effective solution. 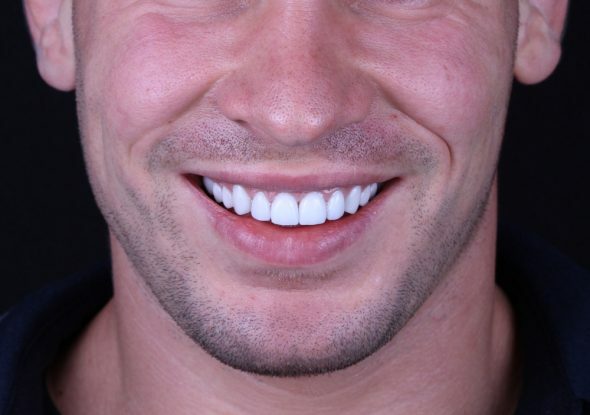 That said, the results aren’t as dramatic as the total smile makeover associated with veneers. Veneers are thin layers of material that fit over the front of your teeth. Your dentist will start by slightly reshaping most of your teeth. Enamel will be removed to ensure adding veneers won’t make your teeth look too bulky. When this is done, a mould of your teeth will be taken and used to create veneers that fit perfectly. Veneers typically require two to four visits, and they can be very expensive. That said, they offer patients the opportunity to completely reinvent their smile, and they even help protect your teeth from staining, decay, and bacteria.